The astonishingly beautiful Theatre was just completed, and it was dedicated [hoau ia] in the evening of this past Monday, and a great crowd filled this very first opening. Robert K. Bonine film, 1921. 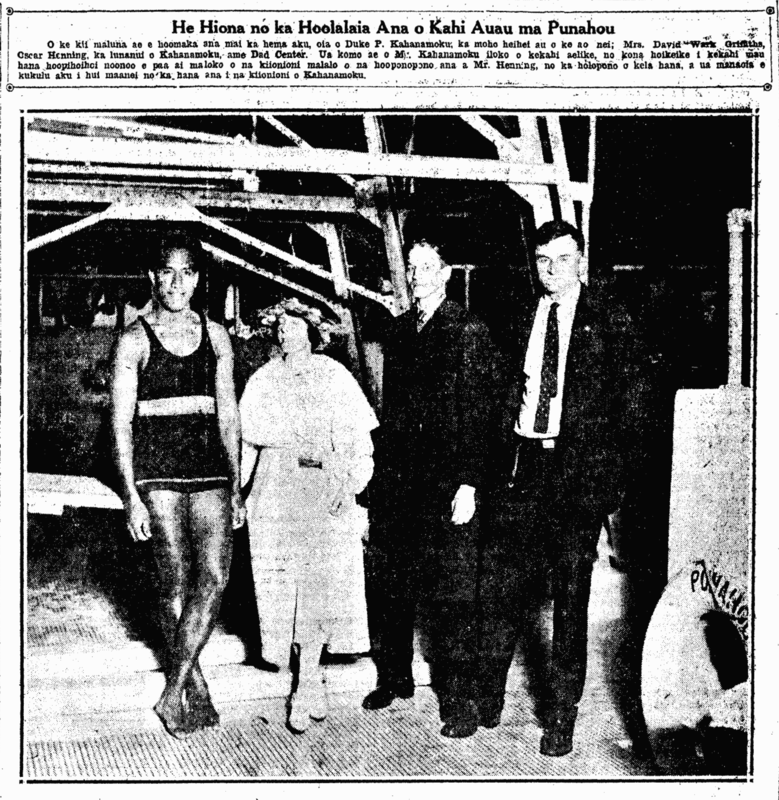 Swim to be held at Punahou, 1922. The picture above [below], beginning from the left is of Duke P. Kahanamoku, the world champion swimmer, Mrs. David Wark Griffith, Oscar Henning, the manager of Kahanamoku, and Dad Center. Mr. Kahanamoku entered into a contract for him to perform some astonishing feats to be made into a movie under the direction of Mr. Henning for the success of that endeavor, and it is believed that a company will be started here to produce Kahanamoku’s movies. Ka Nupepa Kuokoa, Buke LXI, Helu 6, Aoao 5. Feberuari 10, 1922. Waikiki Wedding and Bing Crosby, 1936. Hot air balloon in Paris, riding a camel in India, then an elephant in Egypt…, 1911. Ke Au Hou, Buke I, Helu 17, Aoao 12. Augate 24, 1910. 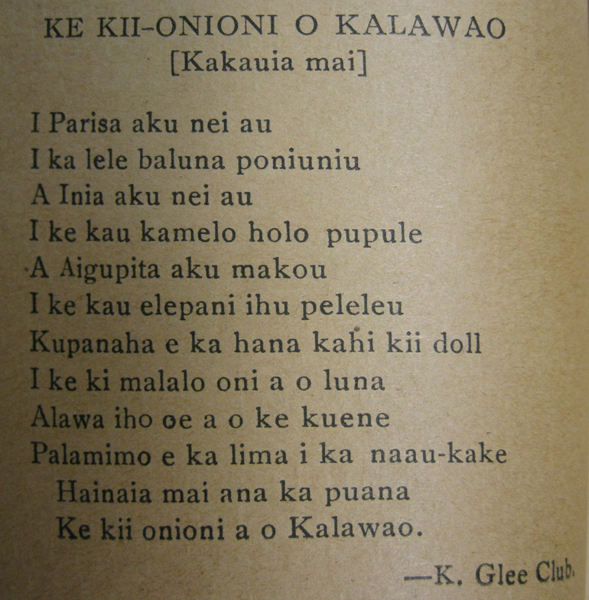 Diamond Kekona writes home, 1908. A LETTER FROM FOREIGN LANDS. This past week, Mr. D. K. Kekona received a letter from his child Dimond Kekona [Diamond Kekona], written in the city of Philadelphia, United States of America, telling of how they are doing and their progress of their work in the foreign lands. These are Hawaiian boys who left the beloved shores of Hawaii nei and sailed to other lands in search of fortunes through singing and playing music with their various instruments. According to what he reported, their work is going well; they receive around $1,425 every week. They are under the direction of a haole that shows movies named Mr. Lubin, and on the first night that showed the movies in the city of Philadelphia, along with their singing of Hawaiian songs, they received a huge sum of money, and on that night in their estimation, there was about ten-thousand people or more gathered there to see the performance of the Hawaiian boys which they heard about. In their band is seven actual Hawaiian boys; each of their names are: Dimond Kekona [Diamond Kekona], Charles Kalahila, E. Davis, Frank Forest [Frank Forrest], Harry Parker, Sam and Willie Jones. There are many other Hawaiian bands in America and they travel all over the place. Mr. D. K. Kekona, Aloha to you and all the family:—I have found the perfect time to write to you this letter to tell you how we are and how our work is here. We opened a show in the city of Philadelphia before a large group of people that numbered about ten thousand. Mr. Lubin is our leader, and he shows movies with our assistance in our singing Hawaiian songs along with playing instruments. Hawaiian songs are very popular. The audience was filled with delight and were pleased until the time when the program let out for the night. The money we make is about $1,425 a week and we earn very good wages for the week. We will be touring other places with our singing. There are just seven of us Hawaii boys. We are all doing good and are in good health. It is very cold here. Ka Nupepa Kuokoa, Buke XLIII, Helu 47, Aoao 4. Novemaba 20, 1908.